Four decades ago, an unknown, Colorado-based photographer created images that inadvertently led to widespread controversy and multi-million dollar auction prices, not to mention a new wave of nicotine addiction. Just south of Sunset Boulevard, M+B Photo is finally giving this body of work its closeup. Norm Clasen’s “Titled (Cowboy)” series is on view in a gallery setting for the first time, though his images already have a confirmed spot in art history, thanks to their later, high-profile appropriation by the artist Richard Prince. One photograph, Sunset Chase, Riverton, WY (1985), depicts a cowboy riding into an orange sunset, whipping a lasso around his head. In a photograph shot in Seymour, Texas, a horse leads its vest-clad, brimmed hat-wearing rider through splashing water. In general, Clasen’s work offers glimpses of stereotypical scenes most frequently associated with Hollywood, or at least Spaghetti Westerns. Norm Clasen, Brazos River Run, Seymour, TX, 1987. Courtesy of the artist. In the late 1970s, the famed Leo Burnett advertising agency hired Clasen to scout locations for a new campaign it was executing for Marlboro cigarettes. The original photographer dropped out of the project, so Clasen did a test shoot. The agency liked his work enough to hire him instead. The cigarette company, which had previously focused on women smokers with its “Mild as May” slogan, wanted to rebrand itself as rugged, masculine, and strong. Advertisements would feature ranchers, or actors posing as ranchers—the ultimate symbols of the (mythical) tough, independent, American (white) male. Clasen believes he got the job because of his easy rapport with the cowboy subjects and the Western landscape itself. “I’ve lived there, I’ve been around them all my life, and I think that was coming through in all my photos,” he told Artsy. Clasen, however, doesn’t smoke. “This was an opportunity to work for the most iconic campaign maybe in advertising history at this time,” he said. “I think anybody [who] saw that campaign over those years realizes it’s the only campaign of its time that created art for their ads.” He has no qualms about contributing. In the mid-1970s, artist Richard Prince was working at Time Life Publications (now Time Inc.), combing through publications daily, when he began to see artistic potential in the Marlboro Man advertisements. Enamored with their simple, evocative depiction of an American archetype, he photographed the ads himself, enlarging them and cropping out the text. 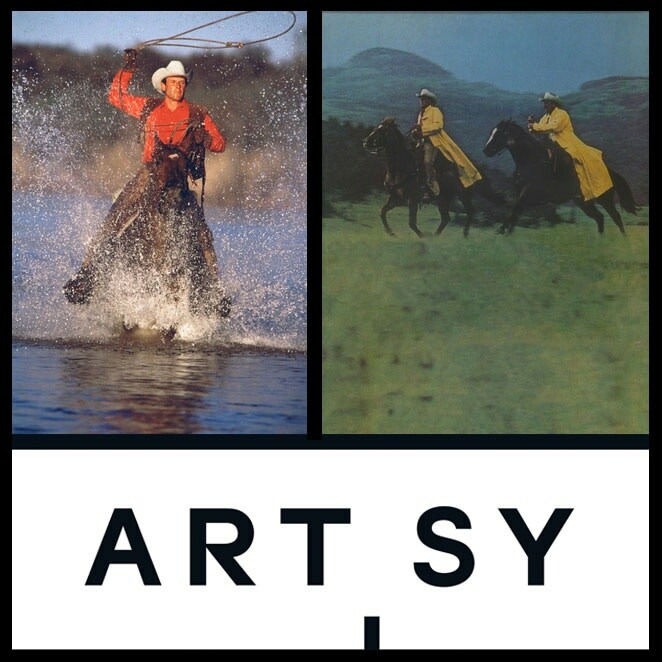 He rebranded the advertisement work as his own “Untitled (Cowboy)” series. Prince never credited the original photographers (though, notably, the original advertisements hadn’t either). He eliminated the photographs’ commercial context and hung them in a gallery setting, making the images “art” in a way that Clasen’s work for Marlboro never was. In 2014, one of Prince’s appropriated works (which cribbed from a different Marlboro-commissioned photographer) realized $3.7 million at a Christie’s auction. Rephotographed images of Clasen’s original shots have garnered over $1 million. Norm Clasen, On the Edge, Cortez, CO, 1987. Courtesy of the artist. Whereas Clasen photographed in the service of a tobacco company, Prince photographed to provoke. When an audience views a photograph, they generally believe what they see—they trust the medium to depict reality, or at least they used to. Yet, Prince simply photographed an art-directed fiction, an image meant to sell a product. In this way, “Untitled (Cowboy)” plays similar games as the “Untitled Film Stills” by Cindy Sherman (another Pictures Generation artist). Her title suggests that her images freeze moments from real movies. In fact, no such cinema exists. Another artist of their era, Sherrie Levine, reshot photographer Walker Evans’s Depression-era images. Captured in the 1980s, by a woman, the appropriated artworks adopt expansive new meanings. Prince has been subject to copyright infringement complaints throughout his career, evidencing no attempt to alter his practice. In 2008, photographer Patrick Cariou filed suit against him for appropriating images from Cariou’s Yes Rasta book. A district court found Prince guilty in 2011, but an appeals court overturned the verdict in 2013. More recently, Prince took material from Instagram, and fine art photographer Donald Graham sued him; the case is pending. Norm Clasen, Mission Ridge, Polson, MT, 1988. Courtesy of the artist.